Laser marking, laser engraving and laser cleaning has gone from cool tech to an industry requirement. The military represents one of the largest and most diverse industries that requires that parts and inventory be marked for tracking, service and safety inspection. Fighter jets and other planes must be de-painted to inspect, service and re-certify parts for continued service. In order to improve marking and cleaning flexibility and processing times, the military has benefited from the use of portable lasers. Items that are too large or located too far away from the depot can now be easily reached and marked as required. The military uses lasers to mark on weapons, vehicle parts, wearable gear, mechanical parts and is now starting to use lasers to clean, resurface and strip paint. 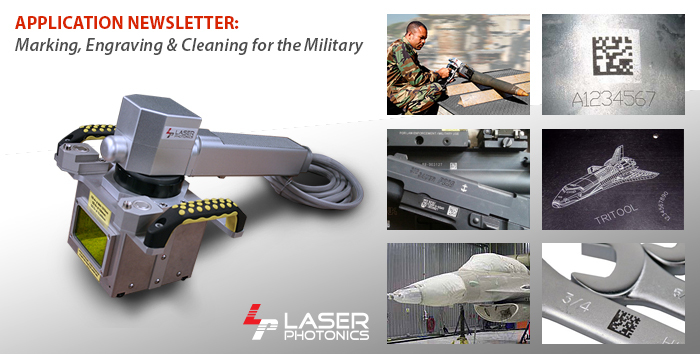 In addition to standard laser marking machines, the military decided on a portable laser marking and cleaning option. The flexibility, portability and durability of the handheld unit is a key factor in that decision. Other industries like aerospace, fabrication, pipe, automotive, technical, food & beverage have also decided on handheld, portable laser marking and laser cleaning. The Handheld Series is available as a laser marking and engraving machine called the MarkStar and a laser cleaning machine called CleanTech Handheld. Each Handheld Series comes with models and exclusive technology and options to meet your requirements. Click or Call us (407-804-1000) today to see which Handheld Series is right for you! We can also start a conversation with you with our Chat feature found at the bottom right of every page on our website. Call, Click or Chat today!